Putting the ball in the court of the municipal corporation on the issue of imposing house tax, UT Administrator Shivraj V Patil today said the Administration would not impose house tax on city residents as it was the duty of the civic body to impose the tax. He said if the MC did not impose the tax, it would "lose out on the inflow of matching grants" from the Union Government. At a meeting of the Advisory Council, Patil told Mayor Raj Bala Malik, Commissioner VP Singh and other MC officials that the Administration would not exercise its special powers to impose house tax in the city. Patil asked the Mayor and the MC officials that it was the duty of the civic body to impose the tax. If the tax was not imposed, the city would lose around Rs 400 crore under the JNNURM and the Administration and the MC would not be able to seek more funds under the JNNURM for future projects, Patil said. The Planning Commission had recently told the Administration to impose house tax. The commission had told the Administration to raise funds from all possible sources, including house tax, to fund its plan. The imposition of house tax was one of the reforms to be implemented in states and union territories that get funds under the JNNURM. The MC had signed an MoU under the JNNURM with the Ministry of Urban Development to levy house tax to raise funds. Members of the house tax assessment committee of the municipal corporation had recently rejected the proposal on the imposition of house tax and the enhancement of commercial tax in the city. Having spent close to three years with the UT police as its head, DGP Pradeep Kumar Srivastava today said “differences” and “factionalism” in the force had adversely affected its image. Srivastava, who retired today, admitted that “rifts” ailed the police. However, these were not able to affect the smooth functioning of the force in any way. “Unlike other union territories, police officers do not get transferred out from here. The police officers are here for many years and thus feel insecure at times when an officer from outside heads them. Merger of the UT police DSPs with the DANICS cadre, which is close to getting implemented, will certainly have a positive effect on the force. We will have better ideas, and infusion of new blood will certainly help sort out the differences,” he said, adding that the differences had never affected the working of the police. "Furrows" have often been reported among DSP-level officers belonging to Punjab and Haryana with a few of them having spats with each other over various issues. “Our image took a beating over the years and it is unfortunate,” he said. He recalled how it was a tightrope walk for him to keep his "flock together" by resolving their differences. During his last address to the force, he came up with an advice for all of them to stay together like a close-knit family. The DGP added that the arrest of SP Desraj Singh, who is under suspension, was a severe blow. “It was sad. It should never have happened. I feel sad on the arrest of the IPS officer but the CBI is doing its job in cleansing the force,” he said. While his focus has been on the welfare and modernisation of the police force, Srivastava said community policing was one area which could do wonders for city policing. “There isn't much crime in the city. Except for one or two cases, all sensational crime cases have been solved. The force learnt its lessons from the Khushpreet murder case and has been successful in solving kidnapping cases,” he said. A farewell parade was organised at the police lines in Sector 26 for DGP PK Srivastava, who retired today. After serving for 37 years in the Indian Police, PK Srivastava joined the Chandigarh Police as the IGP in February 2010 after serving on various prestigious posts in Delhi and other part of country. He was promoted as the ADGP on August 29, 2012. Under the command of DSP BS Negi, nine contingents of the farewell-parade gave salute to the DGP. The senior police officers and all the DSPs along with their families were present in the function. As the DCP,PCR, Delhi Srivastava pioneered the modern police control room. The establishment of that PCR helped in tackling terrorism in Delhi. As SP, Andaman and Nocobar Island, he took interest in the protection of aboriginal tribes of jarwas and also started initiatives to protect the coral wealth of of the island. As DCP, Crime, he busted the match fixing racket, involving Hansie Cronje, the captain of the South African cricket team. The DGP had played an instrumental role in allotting 60 acre in Sarangpur, which will provide accommodation to 1600 policemen. He also procured land for the IRB, Chandigarh. He also initiated projects like underground control room and other modernisation projects. With the major projects of the UT police yet to see the light of the day, the new UT IGP will face enormous challenges and tasks ahead. Ambitious projects of the UT police, which included creation of an underground control room with CBRN preparedness, a shooting range, construction of IRB campus, 1600 police houses and a police training school, were mooted three years ago after PK Srivastava took over as the IGP in 2010. To ensure completion of these projects will be a challenge for the new IGP. A CBI court today framed charges of corruption against Punjab DSP Raka Gira, who was arrested in July last year for allegedly demanding and taking Rs 1 lakh as bribe from a builder. The court simultaneously dismissed Gira’s plea seeking discharge from the case. She had moved the plea on November 1. The trial in the case is now set to begin on January 7, which is the next date of hearing for recording of evidence in the case. The CBI had arrested Mohali DSP Raka Gira in July last year on a charge of demanding and taking a bribe of Rs 1 lakh from a builder for settling his case. The court today framed charges under various provisions of the Prevention of Corruption Act against her. The reader of the DSP was a co-accused in the case. He has now been made a prosecution witness as per the chargesheet after he turned approver. The investigating agency had laid a trap at Gira’s Sector 15 residence after a Mullanpur-based builder, KK Malhotra, filed a complaint against her. The CBI arrested her after they found the marked currency at her residence. The CBI had also carried out search and seizure operations at Gira’s palatial 2-kanal house. The search yielded around Rs 1.2 crore, stashed in various boxes in different parts of the house, and jewellery worth lakhs of rupees. The CBI also found fixed deposits worth Rs 75 lakh and other expensive artifacts. The CBI had also written to the Punjab Government for registering a case of disproportionate assets against her, the nod of which is awaited. Gira was at that time supervising two inquiries registered against Malhotra under the provisions of the Land Acquisition Act. Malhotra, in his complaint to the CBI, alleged that Gira had been harassing him and had demanded Rs 2 lakh as bribe to free him from the cases. In what is likely to be a scramble for admission to convent schools in the city, only 695 children will be able to grab a seat against hundreds of applicants for the city’s four leading convent schools: St John's High School, Sector 26, Sacred Heart School, Sector 26, St Anne’s School, Sector 32, and Carmel Convent School, Sector 9. In government schools, between 2,500 and 3,000 students will be admitted to entry-level classes in over 100 schools. Over 2,000 applicants are expected to apply for admission to these four convent schools. Last year, the applications received by these schools were more than three times the total number of seats on offer. The admission process was set rolling in Chandigarh today. Most of the private as well as government schools issued their admission schedule for the next academic session as per the common admission schedule of the UT Education Department. Admission will be held for entry-level classes. While the Education Department is in the process of compiling the data of the total number of seats available in private schools, according to information submitted by convent schools to the department, St John's High School has 175 seats, Sacred Heart School and St Anne’s School have 200 each and Carmel Convent School has 120 seats. Admission forms in these schools will be available from December 12 to 14 while the forms can be submitted from December 13 to 15. The admission notice is, however, silent on the actual number of seats available for the general public after keeping seats reserved for children from the Christian community, besides siblings of the alumni, the management and the staff. Kavita Das, spokesperson for these four convent schools, said the decision in this regard would be taken by "our managements after considering the number of forms received from all stakeholders". Meanwhile, many other much-sought-after schools, including Bhavan Vidalaya, Sector 33, St Stephen's School, Sector 45, St Kabir Scholl, Sector 26, Saupin’s School, Sector 32, the DPS, Sector 40, Mount Carmel School, Sector 47 and Strawberry Fields issued their admission schedule today. Bhavan Vidyalaya has a total of 100 seats, DPS has 150 while St Kabir has 90. Herb Dhaliwal, the first Sikh ever to become a Cabinet minister in Canada, is here on a mission. Herb remained a Member of Parliament for Vancouver South-Burnaby from 1993-2004 and was the first India-born South Asian to be represented on Canadian council of ministers. He wants to help India meet its growing demand for reliable energy and improve the quality of life in Punjab villages. “We have been successful in creating a vehicle that connects Indo-Canadians to their grassroots. Our Village Life Improvement Programme (VIP) is the functional arm of the Indo-Canadian Friendship Society (ICFS) that has been working in Punjab,” he says. “Our latest mission is to provide toilets in all villages of the state. In the first phase we will work on 20 villages of which 17 are ready with community toilets,” he says revealing that on Saturday Scot Slessor, the Canadian Consul-General in Chandigarh, would visit Chaheru, near Jalandhar, to visit one such village. “We have a budget of Rs 10 crore of which 50 per cent of the funds come from the ICFS while the remaining are contributed by the Punjab government. We are working in tandem with Dr Gurdev Singh Gill who is credited with modernising his native village, Kharaudi in Hoshiarpur as the first VIP village of Punjab,” adds Herb Dhaliwal. Among the villages benefiting from the initiative launched by the ICFS include Retanda, Dhingrian (Adampur), Dhingrian (Jalandhar), Saari, Thakur Kee, Langheri, Saila Khurd and Jian. Before coming to Punjab, Herb Dhaliwal was in Assam to explore the possibility of helping India with Shale gas to meet its growing demand for reliable source of energy. India can count upon Canada for being a reliable energy source. Not only would it supply nuclear fuel but also help India meet its other growing needs, he says. “India also can, and should look to Canada for our globally-recognised excellence in natural gas exploration, development and infrastructure. Furthermore, another related area of contemporary energy advancement in which Canada has an edge is shale gas which could contribute towards meeting India’s growing demand for energy. “Potentially, importing oil in addition to natural gas from Western Canada can be a part of the solution, as India advisedly seeks to pin down and secure other energy supplies. This is the only way you can overcome the looming energy deficiencies that threaten your country’s future, at the risk of fomenting social unrest among your populace,” he added. He would be meeting India’s Petroleum Minister in New Delhi on December 5 to pursue further the possibility of shale gas exploration. India has to give a concrete shape to its shale gas policy. The city will no more house any new industry. UT Administrator Shivraj V Patil today made it clear that there was no scope for setting up new industries in the City Beautiful. If anybody wants to set up a new industry, he can go to the neighbouring cities of Panchkula and Mohali, Patil said. Patil expressed his displeasure over the performance of the IT sector in the city. His statement has raised a question mark over the future of the expansion plans of the IT sector in the city. 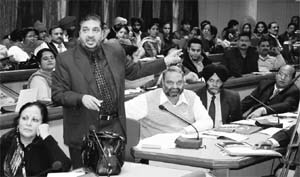 In the education and health sectors, Patil assured that the UT Administration would provide land and other facilities for the expansion of the PGI and Panjab University. At a meeting of the Advisory Council, Patil said since the Administration was left with only limited land, it wanted to use it properly. Patil assured that the Administration would provide more facilities to the existing traders and industrialists. Sanjay Tandon, president of the city unit of the BJP, raised the point of having a proper industrial policy and implementation of the MSMED Act in the city. At the meeting, Tandon also demanded that an action-taken report on the decisions taken at Advisory Council meetings should be prepared and the council should hold at least three meetings in a year. Charanjiv Singh, president of the Beopar Mandal, said the Administration should take care of the needs of traders and industrialists. He demanded that the misuse charges should be rationalised and the building bylaws should be relaxed in the city. PC Sanghi, chairman, FOSWAC, said at present there were violations in 80 per cent CHB flats. The Administration should allow one-time need-based changes in these flats. * UT, Punjab and Haryana should plan "combined development"
Work continued at a feverish but steady pace on the instant 10-storeyed building, planned to be completed within 48 hours, with the eighth floor being erected today evening. As a number of onlookers and mediapersons converged on the Synergy Thrislington complex in the Industrial Area, highly skilled workforce of engineers, supervisors and labourers slogged away at a hellish pace to meet the deadline of 4.30 pm tomorrow. Around 200 workers were seen putting in their best taking the help of three big cranes to assemble the prefabricated structure in which over 200 tonnes of steel would be used. Their target is to make the first-of-its-kind building in the country to come up within the time frame. They will be working throughout the night to meet their deadline. By about 1.45 pm, four floors had been completed and the seventh floor was at the stage of erection. 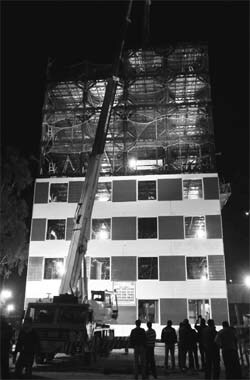 Around 8 pm, the eighth floor was being erected. Harpal Singh, CMD of Synergy, and the brain behind the “Instacon” project, said this evening that everything was fine and he hoped to complete the building on schedule. He said the building was energy efficient and would consume five times less power as compared to brick-and-mortar buildings. He estimated the cost of the building at Rs 1,500 to Rs 2,000 per sq ft, almost the same as in the case of conventional buildings. Describing the upcoming structure as a ‘smart building’, Ashwani Goyal, chief executive engineer of the company, said the 26,000 sq ft building would be totally sealed. Each floor would measure 2,600 sq ft and have 19 pillars, 16 of these external and three internal. The temperature would be maintained at 27 degree Celsius. If for some reasons it happened to increase, motorised curtains would automatically fall. Windows of the building would not open as they were sealed. Goyal said the foundations of the building were made in August within a period of 25 days. There has been a consistent fall in the number of people testing positive for HIV, if the figures recorded at the city laboratories in the past four years are something to go by. While the number of people undergoing HIV test at 14 ICTC-certified labs in the city has been on the rise since 2008, the number of people testing positive for the virus has come down on an year and year basis. Of the total 17,405 people (voluntarily) undergoing HIV test at the city labs in 2008, 1,239 (7 per cent) tested positive for the virus, while in 2009, 1,099 (5 per cent) tested positive for the virus of the total 22,253 people undergoing the test. In 2010, 961 people (4 per cent) out of the total of 23,519 going in for the test tested positive for HIV. The trend remained similar in 2011, where 28,684 persons opted for the test and only 860 (3 per cent) tested positive, while till October 31 this year, 34,581 people went in for the test and only 750 (2 per cent) tested positive for the virus. According to experts, even the social stigma faced by the HIV positive has gone down over the years, elevating the confidence level among the affected people. While the people going in for the HIV test in the city labs represent different age groups, a majority of those found testing positive for the virus in the past four years belonged to the age group of 29 to 30 years. Some new tests have been introduced by the SACS for detecting HIV in newborn babies. According to officials, the virus can be detected within 6 weeks of a child’s birth and its onset can be controlled by using formula milk. No takers for the grant offered by the Central Government to local NGOs for organising awareness of various social issues in the city, under special awareness generation programme came forward. Records of the the Chandigarh Social Welfare Board revealed that of Rs 10 lakh allocated for the city to spread awareness on social or health-related issues, a grant of Rs 8 lakh for NGO was still lying unallocated. Sources said last year, the Union Government had allocated a grant of Rs 2 lakh for this purpose but after the proposal from the city board it was increased by five times. But the irony is that the local NGOs had not applied for grant for more funds till date. Sources said that if the grant was not be fully utilised by the board, objections could be raised and there were chances that there will be cut in the funds, under this head, for the city during next year. Chandigarh Social Welfare Board chairperson Kamlesh said she is going to give another chance to the NGOs to claim this special grant. She said even though the deadline to claim this awareness grant was till June but the Chandigarh board has decided to give another chance to the local organisation to claim it. She said for next one week, fresh applications of the claimants will be entertained by the board and will be forwarded to the central board for approval and disbursal of funds. As per the norms of the centre, any NGO, which has an experience of two years, can claim Rs 10,000 to organise an awareness camps for women and child development in their respective areas. Records of the Chandigarh board revealed that till date only Rs 2 lakh had been disbursed by the central board to the NGOs for this purpose and no new claimant has come forward for getting more funds. Surprisingly, in a recent meeting of the board chairperson with the NGOs, a point was raised that the majority of the NGOs do not do enough publicity of their programmes due to which there is less response from the affected parties to utilise their services. The interested students of The Gurukul, Sector 20, here got tips of acting from the noted actor Susheel Parashar, who visited the school campus here yesterday. Parashar, who has worked in Yash Chopra’s films Neel and Nikki, Jogger’s Park, Chain Kuli ki Main Kuli, besides several serials including Preeto, Mayaka, Astitiva-Ek Prem Kahani, Shanti, Farz, Raahat, Vee Three Plus etc, talked at a length with the students on acting’s finest nuances like expressions on screen, emotions and stage presence. Prashar also highlighted the importance of choosing the right kind of role that fits one’s strength as an actor. Alleging apathy on part of the Panchkula Administration, two couples left the protection house here today afternoon, saying that three of them were huddled in a single room despite having other rooms. They also alleged that for the past couple of days, they were being treated as 'animals' and had been made to starve, following which two of them were ‘forced’ by the authorities to leave the house. It was after Manbir Singh Rathi, legal aid counsel with the District Legal Services Authority (DLSA), visited the house and found the irregularities, Chief Judicial Magistrate Jaibir Hooda made a surprise check here. A report has also been submitted to Anita Chaudhary, chairman of the DLSA. Currently, there are only three couples in the protection house. During the surprise check, the other rooms of the house were found locked. The room where these couples were made to sleep did not even have a latch. As far as security reasons are concerned, not even a single woman constable has been deployed here. There was just one male security guard at the protection house. After the matter was brought to the notice of Deputy Commissioner of Police Parul Kush, three more guards were deployed today. Marked by diversity and traditional rich craftsmen from across the country, the fourth Chandigarh National Crafts Mela began here today. The mega event was inaugurated by Shivraj V. Patil, Governor, Punjab and Administrator, UT, Chandigarh, in the presence of Adviser to the Administrator KK Sharma and other senior officers of the Chandigarh Administration. Around 22 states of the country have joined hands to put up an unbelievable show of handlooms. About 150 craftspersons as well as more than 200 artists from different states of the country are participating in this mega event. The NZCC has invited acclaimed handloom/ craftspersons, which include Shilpa Gurus, National Awardees, Sant Kabir Awardees with the assistance of the Ministry of Textiles, Government of India, and tribal craftspersons, especially selected by Tribal Cooperative Marketing Development Federation of India Limited, Ministry of Tribal Affairs, Government of India, from all over the country. This year, there is a special corner for craftspersons belonging to Chandigarh. The entrance gate styled on the tribal theme is 20 feet in height, which depicts the tribal heritage. The chief guest accompanied by senior officers took a round of the mela. He was deeply impressed with the versatility of intrinsic art forms and skills that are displayed in over 120 stalls. He took a keen interest in handicrafts and handlooms and appreciated the efforts of the participating states in promoting various languishing arts of the country. He also witnessed folk dances on the main stage. More than 100 artists from across the country gave spectacular inaugural performances in ethnic dresses and folk music. The Chandigarh Administration has failed to set up a tax tribunal for the disposal of cases pertaining to the UT’s Excise and Sales Tax Department. The establishment of the tribunal is mandatory under the value added tax (VAT) rules. The tribunal is beneficial in the disposal of cases pertaining to disputes over the payment of sales or excise tax . Presently, the Commissioner of Excise and Taxation hears the appeal regarding any dispute. The issue was raised at the recently held meeting of the VAT Advisory Committee, constituted by the Department of Excise and Taxation. JP Singh Kalra, general secretary of the Chandigarh Business Council and member of the VAT Advisory Committee, said they urged the commissioner to take up the matter with the Chandigarh Administration. The members also demanded to streamline functioning of the department and to end the harassment, being faced by the dealers. The Commissioner was requested to authorise more banks to facilitate the traders to deposit their sales tax conveniently as there was quite heavy rush at the SBI-17 treasury branch, which is the only branch, authorised to receive tax. The number of reserved seats under the RTE Act may go down as the Supreme Court's verdict had exempted as many as 13 city schools, enjoying minority status, from admitting 25 per cent children from the economically weaker sections (EWS) and disadvantage group. The schools are required to reserve 25 per cent of the total seats under the RTE Act. In 2011-12, the department had estimated about 1180 reserved seats under the RTE Act in the 70 unaided private schools in Chandigarh. Ram Kumar Sharma, district education officer, said there seemed to be some decrease in the number of reserved seats after the verdict the SC’s verdict but exact number of the seats would be known only after they compiled the admission details of all the private schools. However, the department has estimated that the decrease in the seats would not be more than 10 to15 percent because although the minority schools were exempted from the RTE Act provisions, yet they will have to adhere to the 15 per cent EWS quota in lieu of the land allotted to them at concessional rates. The officials, however, clarified that the schools, who are seeking minority status, would have to adhere to the reservation under the RTE act. A number of private unaided schools in the city are already making efforts to attain minority status. Meanwhile, despite enjoying minority status, St Stephan School, Sector 45, has reserved 25 per cent of its total seats for the EWS and disadvantage group. Fifteen-year-old Gunit Cour is all set to make debut in Punjabi film “Stupid 7”, directed by playwright-turned-filmmaker Pali Bhupinder. “I am playing one of the lead roles in the movie,” informs Gunit, a resident of Sector 15. “My character, Divya, is lively and friendly, yet a bit careless with hardly any clarity about the career to choose,” she adds. This character will help many youngsters to introspect, says the budding artiste, whose movie is set to release in January next year. Gunit says the movie brings to fore problems faced by adolescents, and she is lucky to have landed this challenging role. The meeting of the college principals remained inconclusive as the principals failed to reach a consensus on the issues of the appointment of regular teachers in the colleges of Punjab and paying them a salary as per the UGC norms. The meeting was held at Panjab University and 140 principals of the colleges, affiliated to the PU, participated in it. Meanwhile, the principals agreed that the teachers were being exploited. They agreed that the teachers were getting low salary for their services, which was in violation of the UGC norms. However, they emphasised that a middle path should be adopted so that fund-starved colleges do not face trouble. A committee has been constituted in this regard. The key agenda of the meeting was the recruitment of regular teachers in the colleges and paying them as per the UGC norms. A large number of colleges in Punjab are paying salary between Rs 4, 000 to Rs 10,000 to teachers and are violating the UGC norms. However, the principals expressed their helplessness in paying higher salaries to the teachers. RS Jhanji, principal, AS College, said certain mechanism should be evolved by the Punjab government or the PU so that reasonable salaries could be paid to the teachers. “The government colleges in Punjab that are completely funded by the government have failed to pay salaries higher than Rs 10, 000, then, how can the private self-financed or aided colleges be expected to pay as per the UGC norms," Jhanji said. Gurdip Sharma, principal, GGDSD College, Hoshiarpur, said a middle path should be adopted till the situation in the colleges of Punjab improved. “The teachers can be paid as per the PU calendar, which states that teachers should not be paid less than the basic pay, which after calculation stands at Rs 21, 600," he said. The principals said if the state government lifted the ban on the appointment of regular teachers, then all colleges would get a regular faculty and they would be paid as per the UGC norms. Vice-Chancellor Arun Grover decided to form a committee to work out a solution regarding the issue and asked the principals to prepare a representation, which could be discussed with the Chief Minister or the Secretary, Higher Education, Punjab. The three-day cultural bonanza of the annual function flagged off with a grand inauguration of the school auditorium at St Anne’s, Sector 32, The Bishop of Lucknow Rt Rev Gerald J Mathias and the Bishop of Shimla Chandigarh diocese Rt Rev Ignatius Mascrenas presided over the function. In his message to the parents Bishop Ignatius spoke that to raise the children is a challenge these days. But with the sincere efforts we can make them shine like beacons of light. An impressive inauguration ceremony followed and the motto of the school “Let your Light Shine” was unveiled. This was followed by the annual function La Lumiére-2012. Devotional qawali-Ibadat by the students of class IV reflected that in the fast pace of life we need prayers and devotional songs to bring divine light with in us. The students of class V presented a story of three candles love, peace and faith-Elixir of Hope. An impressive play “meetha zehar” was also staged. Ankur School, Sector-14, celebrated “Gurpurb” on the school premises. All the staff and students gathered for the event. The atmosphere was surcharged with beautiful vibes. Teachers recited “Japji Sahib” and the students of primary wing presented “Shabad”. In order to develop creative skills in the children and bring them closer to nature, Kids 'R' Kids School, Chandigarh, organised a pottery workshop. The students of class KG to class IInd participated in making aquatic creatures, land animals and flora and fauna on a potter's wheel. A small miniature snail was redone by a group of 16 students. The children found the activity very unique and they were excited to see the conversion of raw clay into beautiful pieces of pottery. In collaboration with Punjab Traffic Police, AKSIPS Mohali Smart School organised an interactive workshop for classes VIII to X. Students were briefed about the road safety and road signs. In order to contribute to the subject, head constable Harjinder Singh, traffic and education cell, Mohali and MHC Sobha Singh sensitised the students about obtaining learner’s license and about their responsibility towards safe traffic. This informative workshop proved to be beneficial for budding drivers and young children. Director Jasmine Kalra and Administrator Siddhant Kalra urged the students to adhere to the traffic rules.